Jim Howard strapped himself into the Cessna 172P and beside him in the cockpit sat the pilot painstakingly and carefully performing the pre-flight checks. As the plane took off, the pilot at the controls was 18 year old Hugh Alvin Wade, a junior at Hobe Sound College, where he is now 6 months away from obtaining his BA in Inter-Cultural Communications and Aviation. Hugh took his first solo flight at the age of 16 in Corozal, Belize after taking lessons with retired USA Air Force Colonel, Gordon Scott. While many of his friends and classmates spent the summer relaxing, Hugh was in the Amazon Jungle for half of the summer drilling water wells for the indigenous people of Peru and Brazil and the other half at Clearflight’s facility in Fort Pierce, Fl. with his heart set on earning his private license. For seven and a half weeks, he attended ground school, learning the theory on how to make a flight plan; how to calculate weight and balance; how to navigate; the rules of airspace; and understanding the mechanics of planes. He also took air traffic control classes and took many solo flights across Florida. After an evaluation flight and an oral test by an FAA examiner, he took one last two-hour flight with the FAA examiner that would determine whether he would receive his license. When he landed the plane, Hugh said “I was so happy; all I heard was 'Congratulations.'" Friends and classmates ask him if he is worried about accidents and he said absolutely not. "You have more of a chance crashing on the road with people driving erratically," he said. “In a plane, you have the control tower looking out for you. Young Hugh Wade takes his role in the cockpit seriously, and he approaches his future in the same way. 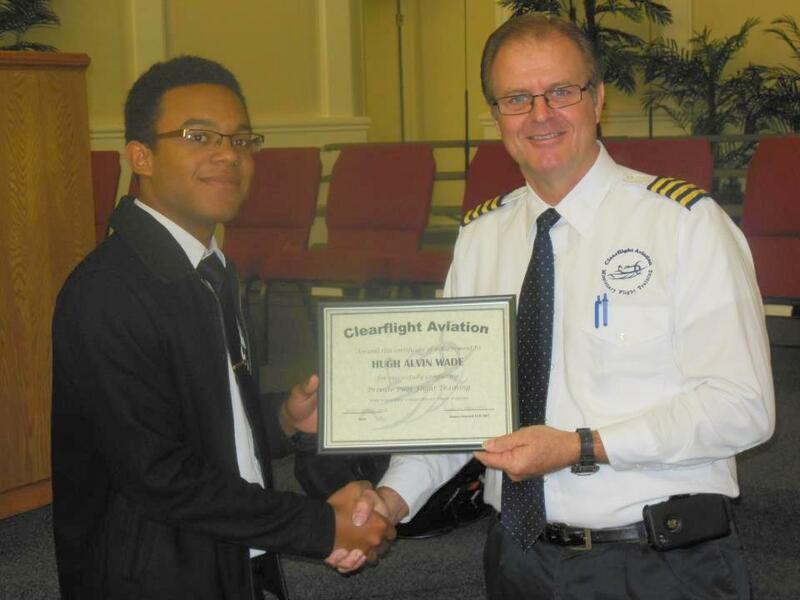 After graduation next year, he plans on continuing to earn his instrument ratings required to fly commercial passenger planes, and his certified flight instructor rating. As an instructor, he can teach and earn money, all while accumulating the necessary flight hours required to reach his ultimate goal: becoming a pilot for a major commercial airline by the time he is 23, the minimum age set by the FAA. When asked for his advice to young people, he said "If you set a goal, accomplish it.” “Always set goals and shoot for them." "I am glad my parents supported me when I decided on this path to leave Belize. It’s a career with so much potential that you can build on later on in life. My parents allowed me to feel out my career paths, and supported me along the way. 'As long as it’s what you want to do, just do it', said my dad." Hugh would to thank his sister Pamela and her husband Gordon Butcher of Hobe Sound, Florida who supported him during his time in the USA. He would also like to thank his sister Clara of Tyler, Texas for her encouragements and moral support. Join us in congratulating 18 year old Hugh Alvin Wade for his accomplishments! He is one of the newest pilot in South Florida! We are proud of him and looking forward to seeing where the future leads for this bright young man. And congratulations to his parents, Hugh and Kendra Crawford Wade of Ranchito Village, Corozal, Belize. Well done, Hugh! Be safe, have fun and keep learning! Nice. I am proud of him. So very proud of you my cousin; may God keep blessing you and your family. This is excellent...I gotta meet him Linda. Congrats, very bright future ahead. YES! Congratulations to Hugh. Keep on keeping on. I am so, so happy for him!! Congrats.